We offer superior quality Retractable Banner Stands and Telescoping Banner Stands and Banner Displays at great competitive prices! Many sizes, widths and banner styles are available. Available with printed banner graphics, or with hardware only. 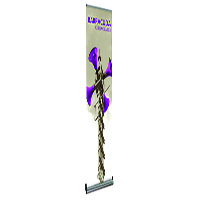 Choose from Single Sided and Double Sided Banner Stands, as well as Drop-in Interchangeable Banner Cassette options. Replacement Banner Graphics Printing available for all manufacturer''s Hardware and Banner Stand Styles. Banner Stand Lighting and shipping Cases are also available. Low Pricing and Quantity discounts! 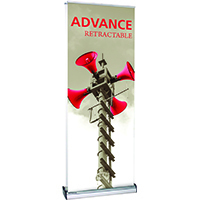 The Advance Retractable Banner Stand offers drop-in graphic cassettes for frequent and simple graphics changes! The Imagine Retractable Banner Stand is a premium unit that features a removable graphic cassette making frequent graphics changes a snap! 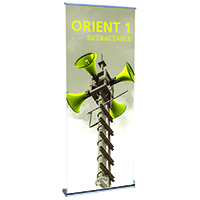 The single sided retractable Orient banner stand is both easy to assemble and simple to use. 4 widths available! This Premium retractable banner stand comes in anodized silver and has heavy duty molded end plates. A padded carry bag is also included. The double sided retractable Orient 2 banner stand is finished in anodized silver with heavy duty molding end plates. Carrying bag also included. 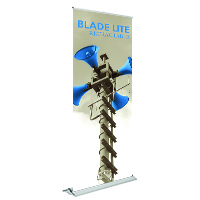 The Blade Lite 400 Retractable Banner Stand 15.75"wide x 69.38" high, graphics included! The Blade Lite 600 Retractable Banner Stand 24"wide x 83.25" high, graphics included! 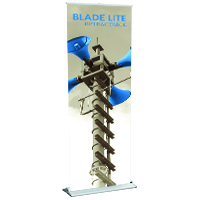 The Blade Lite 800 Retractable Banner Stand 31.5"wide x 83.25" high, graphics included! 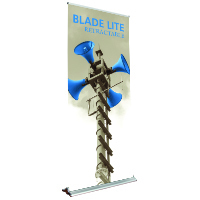 The Blade Lite 850 Retractable Banner Stand 33.5"wide x 83.25" high, graphics included! The Blade Lite 920 Retractable Banner Stand 36"wide x 83.25" high, hardware only or with graphics included! The Blade Lite 1000 Retractable Banner Stand 39.25"wide x 83.25" high, graphics included! The Blade Lite 1200 Retractable Banner Stand 48"wide x 83.25" high, hardware only or with graphics included! The Blade Lite 1500 Retractable Banner Stand 59"wide x 83.25" high, hardware only or with graphics included! The Barracuda Retractable Banner Stand is a Premium Display solution that offers adjustable height for use anywhere! The Barracuda 850 Retractable Banner Stand is a Premium Display solution that offers adjustable height for use anywhere! The Barracuda 920 Retractable Banner Stand is a Premium Display solution that offers adjustable height for use anywhere! This 24" wide Retractable Banner stand fits anywhere and will get your message noticed! Contender Standard Retractable Banner Stand will get your visual message noticed at your events! 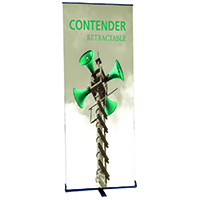 The Contender Mega Banner Stand is a great way to get your visual message boldly stated! The Contender Monster Retractable Banner Stand offers a full 48" wide graphic Banner to get your message noticed! 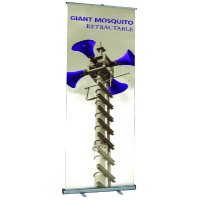 The Giant Mosquito Retractable Banner stand stands above all the rest with a maximum graphic height of up to 122" high! The Mosquito 1200 Retractable Banner stand offers a 47.25"w Banner graphic to make a big visual impact. 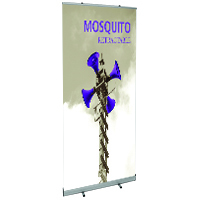 The Mosquito 1500 Retractable Banner stand features an overall width of 59" for maximum graphic impact . We are proud to offer a wide range of Banner Stands and Banner Displays to meet your size and budget requirements. From portability, to size, to cost, to flexibility… we’ve got you covered with products that will make your events easy and successful every time! We offer high quality printing to make your graphics stand out and can deliver the finished product fast to meet your deadline! All banner stands are lightweight and come in padded carry bags making transport a breeze! Banner Stand shipping cases are also available! Orbus brand Premium Quality Retractable Banner Stands include a lifetime warranty on the hardware! Our Premium Orient, Blade Lite, Barracuda, Imagine, and Advance Banner Stand lines are a great investment, and offer superior quality and durability, lasting over time and repeated use. We will repair or send parts as needed if damaged from normal wear & tare. These stands are designed to last, and many customers end up having us replace the banners with new updated graphics and continue to use the banner stands. We offer Banner Stands in a wide range of sizes to meet your Trade Show needs! The Blade Lite, Barracuda, Orient, Contender, and Mosquito Retractable Banner Stand lines all offer several widths to choose from making it easy to find the right size to fit your needs. From 15.75” wide up to 59” wide, we have a size for you! Overall heights vary too, and many are telescoping in height to allow you to customize your banner size as desired. 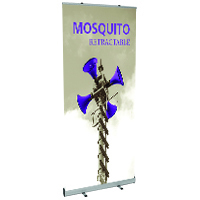 The Giant Mosquito Banner Stand can extend up to 122” high! If you are creating a backdrop using several stands, adding banner stands to work with your existing trade show display, or looking to market your brand in a lobby or business setting, there is a size that will fit your needs! Imagine Banner Stands and Advance Banner Stands allow variable marketing and messaging capabilities! The Imagine Single-Sided banner stand and Advance Double-Sided Banner Stands feature a drop-in interchangeable retractable cassette that houses your banner graphic. This allows you to have several graphic options that you can swap out frequently from event to event. These are great if you market different products or services, or appeal to different audiences at your events. Just swap out the cassette and you are on your way! Telescopic and X-Style Banner Stands allow custom sizes and the same messaging area as Retractable stands at a budget friendly price! The Pegasus Standard, Pegasus Supreme, and Trio-2 Telescopic banner stands allow you to pick your banner size! Pegasus Telescoping Banner Systems allow adjustability in both height and width, creating a custom graphic size per your requirement up to 10’ wide and 10’ high! The Trio Telescopic banner stand has 2 width capabilities, and you can tailor the banner height as needed. Our new X-TEND Spring Back Banner Stands feature X-style tension hardware that grabs the printed banner at the corners pulling it taught. Super lightweight at just 2-4 pounds, the X-TEND Banner Stands are available in 5 widths at varying heights. Outdoor Banner Displays and Flag Displays for outdoor events in all climates! We offer several Outdoor Banners Displays and Flag Displays that are rated for use in variable weather conditions and outdoor applications. Our Zoom Flex Outdoor Flag Displays come in 4 heights and feature 4 flag shapes to choose from, offering the best solution to feature your name or message boldly. These spinning flag displays include floor and ground base options, as well as weight options for stability making them versatile to adapt to any terrain or scenario. Our Wind Dancer Flag Line, Blizzard Banner Display, and Thunder Banner Stand all offer weighted bases for use outside on uneven ground and in normal wind conditions. All outdoor graphics are printed on weather resistant flag or scrim materials to withstand normal outdoor use. Contact us today to discuss your needs, we will be happy to suggest the products that best meet your needs and budget! We offer free estimates and quantity discounts too!